Remember when you used to poke people on Facebook? That seems kind of strange now. Maybe 10 years from now, people will look back on Instagram or Snapchat and be all “What?!??!”. Anyhoo, this isn’t a blog post about the Facebook type of poke. Nope, it’s poke as in pokē the Hawaiian verb for “section” or “to slice or cut” or “to cube”. Think of bright red jewel-like cubes of raw tuna in a subtle marinade of soy and sesame oil with just a hint of crunchy onion. Mmm, are you hungry now??!? And I should mention, it’s pronounced poh-kay (to rhyme with okay). Legend has it that Hawaiian fishermen would take the off-cuts of their daily catch, cube them, add a little seasoning and enjoy as a snack (what a job perk – tuna on demand!). Poke seasonings are heavily influenced by Japan (hence the soy and sesame) as well as the local Maui onions. 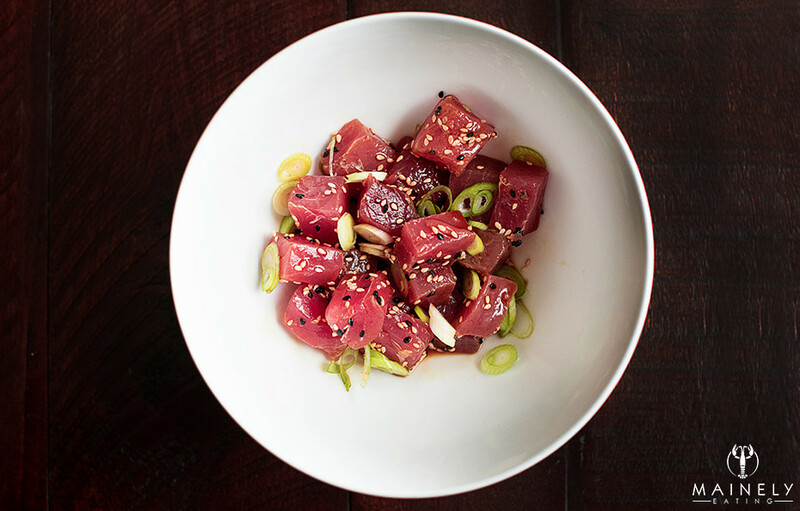 Poke can be made with tuna, salmon and even cured octopus. 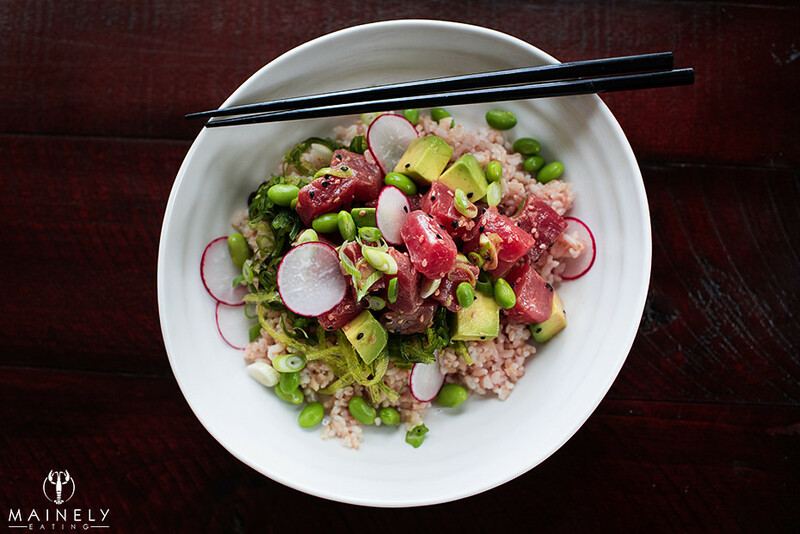 Right now, poke is THE food to eat and here are some reasons why. Just a few weeks ago I was in Ohio (of all places), checking out the best places to eat on yelp and I enjoyed the most unexpectedly-delicious bowl of tuna poke by Hai Poke at a pop-up location in the Short North area. 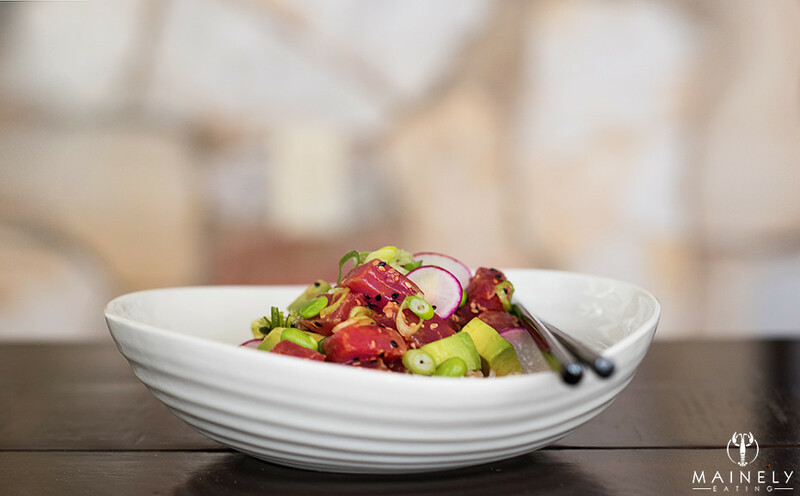 I’ve written before about the wonders of being able to buy sushi-grade tuna from Browne Trading Company and when I stopped by this weekend and saw the beautiful red tuna loin in the seafood counter, I figured I’d try making a poke-inspired dish at home. Assuming you can get your hands on top quality fish, it couldn’t be easier! Mix up a marinade of soy sauce and sesame oil (Ponzu is my secret weapon for a non-authentic but delicious citrus twist), add the cubed tuna, a handful of scallions and a sprinkling of sesame seeds and you’re done! Add jalapeno, chili flakes or a little sriracha if you’re feeling spicy. To make your poke into a more substantial lunch or dinner, make a poke bowl which strays into chirashi territory (chirashi means scattered in Japanese and so a chirashi bowl is basically a bowl of scattered/decontructed sushi). 1. Combine soy sauce, ponzu, sesame oil, sesame seeds, scallions or onion to make marinade. 2. With a super sharp knife, slice tuna into cubes. Discard any sinewy pieces. 3. Place diced tuna into a bowl. Gradually add marinade, you want the tuna to be glistening vs. drowning. Store in refrigerator (covered) for up to 12 hours. 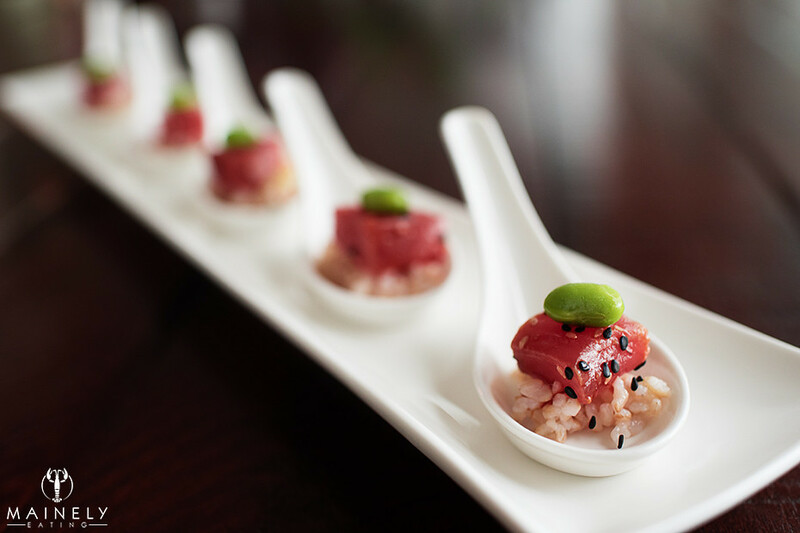 I had a little poke left over so thought I’d try out poke appetizer spoons (read about other tuna appetizers including tuna tartare cones and spoons here), these would be good for a health concious gathering. Make up the poke according to the above recipe and then fill each spoon with a little brown rice, a cube of tuna poke and top with a scallion slice or edamame bean (because I like edamame more than scallion!). Look for shoyu soy sauce without gluten if you have a gluten-free diet. Fiddleheads are the furled (not yet opened) fronds of a young fern, specifically the Ostrich fern (a good source of omega-3 and omega-6 fatty acids as well as iron and fibre) vs. Bracken (carcinogenic and toxic if not fully cooked!). Back in the 1990s, raw or lightly cooked fiddleheads were implicated in a food-bourne illness outbreak and so it’s important to prepare and cook them safely. 4. The official guidelines say to boil them for 15 minutes. I’m not a fan of mushy fiddleheads so I usually boil them for ~8 minutes but you should use your own judgement here in terms of risk vs. taste. Fiddleheads have a similar texture to asparagus but without the funky asparagus taste. 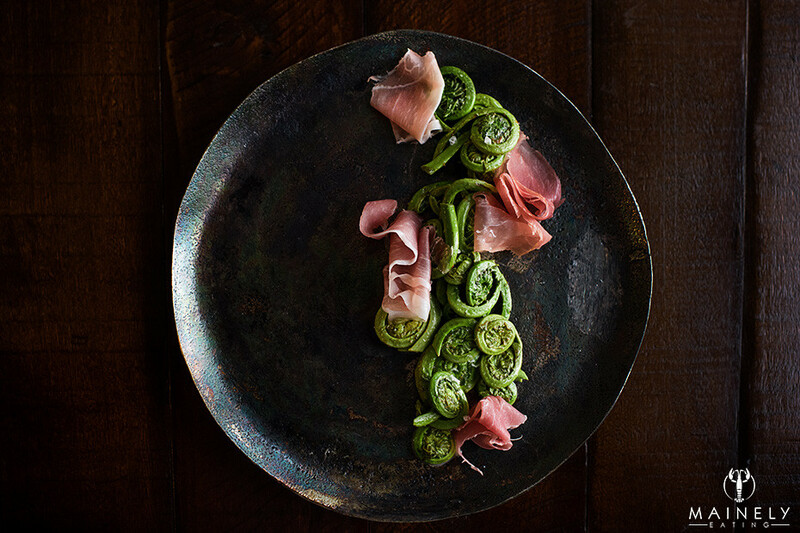 My favorite way to enjoy fiddleheads is to boil them and then lightly saute in a little butter with a very generous squeeze of lemon juice and pair with salty prosciutto. 3. Add the fiddleheads to the boiling water. Boil for 15 minutes (according to health authorities) or for less time at your own risk (I usually boil for ~8 minutes but I’m not advocating this risky behaviour). The water will turn a weird brown color. I like to rinse the fiddleheads with fresh boiled water from the kettle. 4. Drain the fiddleheads in a colander. Rinse out the pan and return it to a medium heat. Add the butter, the drained fiddleheads, the lemon juice and lightly toss. Add a few good grinds of black pepper and a few pinches of sea salt (preferably Malden). 5. 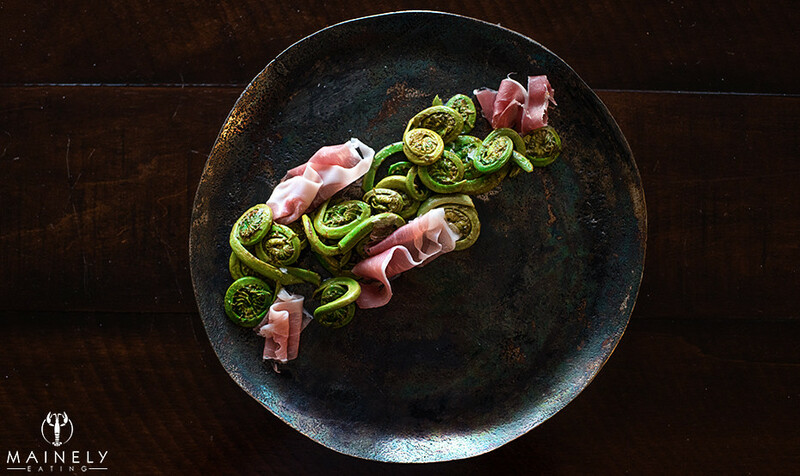 Place the fiddleheads on a warmed plate and drape a few slices of prosciutto alongside. Add an extra squeeze of lemon juice. Have you ever cooked or eaten fiddleheads? What did you think? I’m also super excited to see ramps at the market and plan on pickling them to last through the summer! 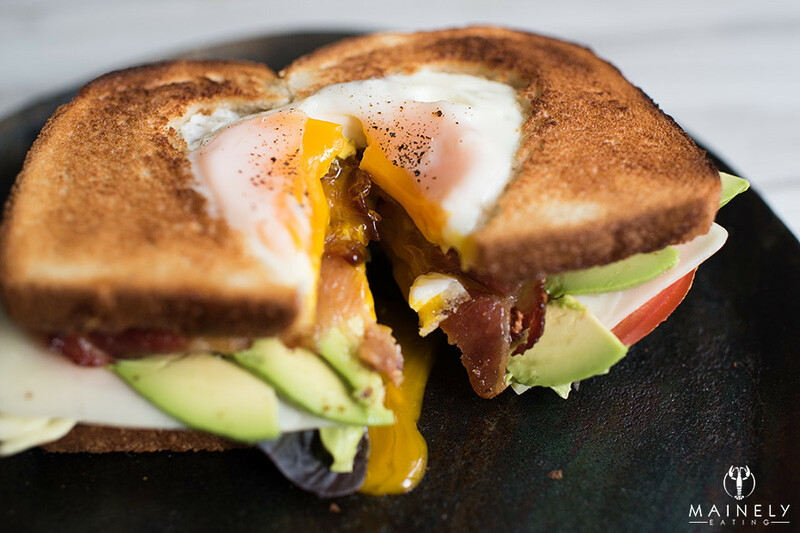 Nothing says “I love you” more than a hot sandwich piled high with crispy bacon, creamy avocado slices, juicy tomatoes and topped with egg-in-a-hole toast (hit refresh to see the sandwich being built in the above gif). Am I right? If someone made me this sandwich I’d be a happy bunny indeed! And if my Mom happened to be visiting from the UK, I would totally be making her one of these for Mother’s Day. 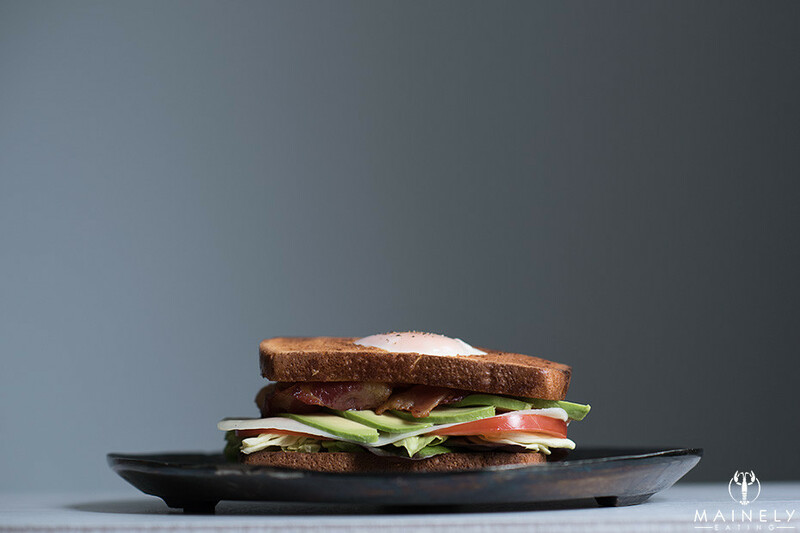 Cook the bacon until it’s your kind of crispy, in the meantime toast a piece of bread, butter it, add mayo, layer with lettuce, tomato slices, cheese and avocado. Using a sharp knife, cut a heart shape out of a second piece of bread and toast it using the bagel setting on your toaster (you only want to toast one side, the other will cook in the pan with the egg). Set aside the bacon and wipe out the pan. Add a little butter and/or vegetable oil to the pan. Cook the egg in the heart-shaped hole of the toast (cover the pan to set the top of the egg or broil for 20 seconds at the end) and enjoy! Set aside the cooked bacon to drain on some paper towels and wipe out the pan. Add the butter/oil to the pan, once it’s melted (low-medium heat), gently place the bread in with the toasted side up/non-toasted side down. Gently pour the egg into the heart shaped hole. Cook until the egg is your preferred level of done. It can help to put a lid on the pan to cook the top of the egg (or hold the pan under the broiler for 10-20 seconds right at the end). Using a fish slice, slice the egg/toast out of the pan and top your sandwich with it! You can also mix a little sriracha into the mayo or add a few red pepper flakes if you like things spicy. This is definitely a knife and fork and extra napkins kind of sandwich!